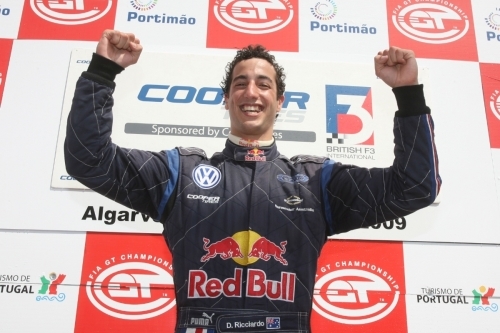 Daniel Ricciardo sealed the Cooper Tires British Formula 3 International Series championship in Portimao yesterday. The 20-year-old Australian, started the weekend off by securing third place on the road, although this was actually a victory in the British standings, with the first and second placed drivers in the invitation class. Max Chilton and Riki Christodoulou’s close battle saw Rising Star Max just edge past Superstar Riki on lap eight to claim sixth place, which is how he finished. Hywel Lloyd’s first race finished up with him in tenth place while Jay Bridger was the last of the BRDC Sueprstars and Rising Stars to finish in 13th. In race two Daniel suffered a damaged front wing in the early stages and dropped back to seventh by the end of the race. But due to the fact that he was fourth of the regular British Formula 3 International Series drivers, this was enough to seal the championship having already won six races this season and taken 11 podiums. Max Chilton had fought his way up to third and was the first of the British Formula 3 International Series drivers. Henry Arundel was eighth behind Daniel, whilst Hywel Lloyd was just behind Henry in ninth. Jay Bridger was 11th with Superstar Wayne Boyd the last of the BRDC young drivers to finish in 17th. Superstar Stuart Hall was part of the championship winning Aston Martin Racing Team who secured the Le Mans Series title at the 1000km of Silverstone yesterday. The 24-year-old drove the final part of the race in the Lola Aston Martin 008 and managed to move from 28th through to 12th by the chequered flag following a mechanical problem, which saw the car sit in the garage for half an hour. Fellow Superstar Andy Meyrick also finished the 1000km race nursing home the Kolles Audi R10 TDI in sixth place to save on fuel. BRDC Rising Star Greg Mansell, making his first appearance in the Le Mans Series alongside his father Nigel and Ginetta Chairman and BRDC Full Member Lawrence Tomlinson, brought the Ginetta Zytek home in 28th place. The car had two lengthy spells in the garage with mechanical problems. Alexander Sims took a brilliant double victory as a guest driver in the Radical European Masters at Silverstone over the weekend. The BRDC Superstar and Full Member was in a Radical for the first time in his career but adapted extremely quickly from his Formula 3 Euroseries driving style to secure a win apiece on Saturday and Sunday. Will Bratt took a double victory in the triple round of the PartyPokerRacing.it Euroseries 3000 in Valencia over the weekend. The first victory came on Saturday when having started the race from pole position, the BRDC Rising Star took the lead from the start and managed to hold off Fabio Onidi to secure his second win in as many races. Having finished fifth in race two, his second victory of the weekend came on Sunday afternoon as the 21-year-old shot from fourth onto the grid into the lead by the second corner. From here he lead all the way to the finish and moved himself into equal third in the championship. Phil Quaife was eighth in the second FIA GT3 race of the weekend in Portimao. The BRDC Rising Star was driving the CRS Ferrarri 430 Scuderia with Danny van Dongen as co-driver for the 33 lap race.